The Greeting Card features an original image created by artist Karin Konoval. It is from a new series of paintings entitled auditions, 2day! which celebrates life in "the biz." She hopes you'll enjoy the cards and the paintings... there's much more to come! 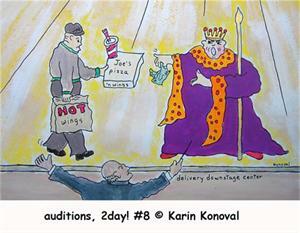 Karin Konoval is an actor, writer and visual artist. She has extensive credits in film and TV, and has received several awards and nominations for her work in theatre. Karin's short stories have been published in anthologies, literary magazines, and broadcast on CBC radio. Her artwork has been exhibited in festivals and galleries.